I’m an Ivory girl and when I turned 40 I bought myself a big pot of Oil of Olay. I always have my hands in dishwater so hand lotion is key. And I use a sulfite-free shampoo so there is more bounce than frizz in my curly hair. But other than those beauty products, I prefer to eat my way to healthy skin and hair. Healthy skin needs water, first and foremost. If your skin is not getting enough water, expect dry, tight and flaky skin. Dry skin has less resilience and is more prone to wrinkling. Given the rain we’ve had lately, drinking your nine glasses per day (13 for men, per the Mayo Clinic) is certainly a sustainable practice. Just do so from a reusable container. Christine Burn Rudalevige at work making the eggs in cocotte. In her book, “Eat Pretty: Nutrition for Beauty, Inside and Out,” former beauty editor turned health coach Jolene Hart first outlines “beauty betrayers” – things like alcohol, caffeine, canned foods with bisphenol A, dairy, gluten, fried foods, conventionally raised meats, pesticide-sprayed fruits and vegetables, processed foods, soda and sugar – that contribute to a body’s free radicals. These reactive oxygen molecules are missing an electron, she writes, because they were exposed to things like UV rays, pollution, pesticides, oxidized fats and sugar. The lonely electrons steal electrons from skin cells, Hart continues, sucking the life out of your collagen so that you get wrinkles – unless you feed them enough anti-oxidant-rich foods, many of which we can find locally and in season in Maine. The high anti-oxidant food I noticed on my walk through the farmers market last week included dark green leafy vegetables like kale, collards and spinach; dried beans; sweet and white potatoes. And, should it stop raining, the red raspberries and blueberries are coming. Hart also pushes pasture-raised proteins – eggs chief among them – as the best sources of amino acids that help repair damaged cells, and foods with omega-3 fats, such as the Maine coast’s abundant seaweed and fatty fish supplies, to help preserve collagen stores needed for soft, supple, elastic skin. 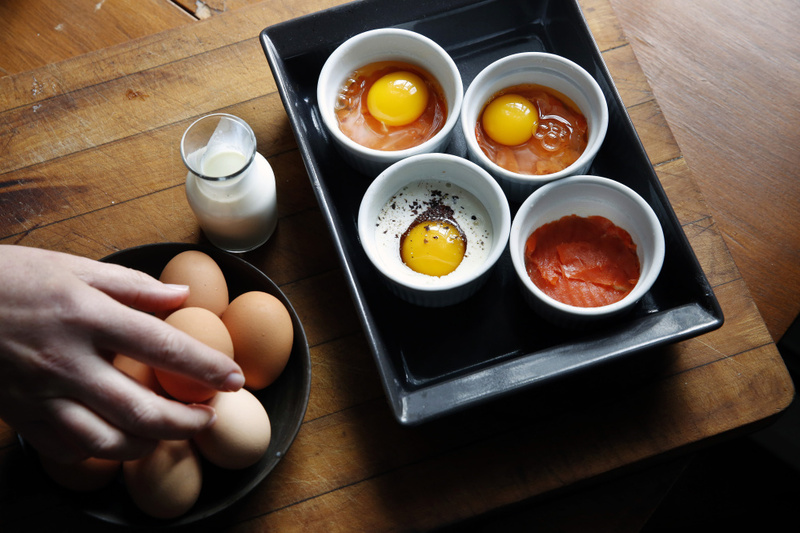 Heavy cream is pored into ramekins lined with salmon, then egg to make eggs in cocotte. But the chapter of “Eat Pretty” that caught my cook’s eye was the one on how the different herbs and spices play into my body’s radiance once they’d done their job on the plate. The more exotic (read as “from away”) types do have to be trucked in. But bought whole and in bulk and roasted as needed, they can be used quite sustainably. Oregano and thyme are powerful anti-oxidants that can fight those aforementioned free radicals. Basil, Hart writes, has flavonoids that protect skin cells from oxidative damage and fennel seeds are high in quercetin, a UVB-protective phytochemical. Cardamom, cumin, mint, parsley and sage all promote detoxification so your skin glows, she adds. Cinnamon keeps blood sugar steady, preventing insulin spikes that lead to wrinkles and blemishes. If your skin does get inflamed, cloves and turmeric are anti-inflammatory agents. Rosemary boosts mood and memory. And nutmeg helps bring on the beauty sleep, according to Hart. I, for one, am pleased that I can now count my well-stocked spice cabinet as a full participant in my green-eating beauty regime. The finished dish, served with a crusty bread. I first had this breakfast combination at a B&B in Kinsale, Ireland. The innkeeper beat the eggs and microwaved them as it was convenient. I prefer them slowly coddled in a water bath in the oven. 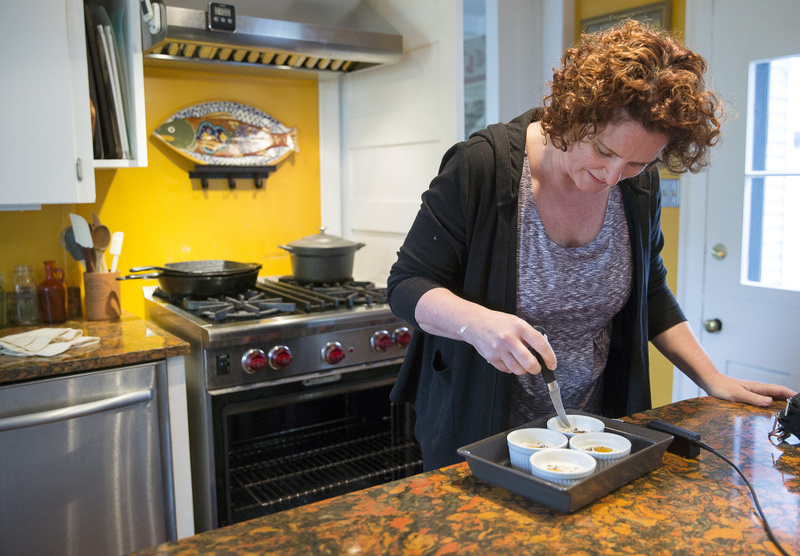 The eggs are pastured, the cream is local, the salmon is smoked so you need very little, the dulse adds a bacon-like crumble with more minerals, and the herbs make it, and you, beautiful from the inside out. I’ve written this recipe to serve four, but it easily grows to accommodate as many eaters as you’ve got around the table. Heat the oven to 375 degrees Fahrenheit. Grease four (6-ounce) ramekins with the melted butter and place the ramekins in a 9- by 13-inch baking dish. Arrange the salmon along the bottom and up the sides of the ramekins. Pour 1 tablespoon of the cream and crack an egg into each ramekin; season with the dulse flakes and black pepper. 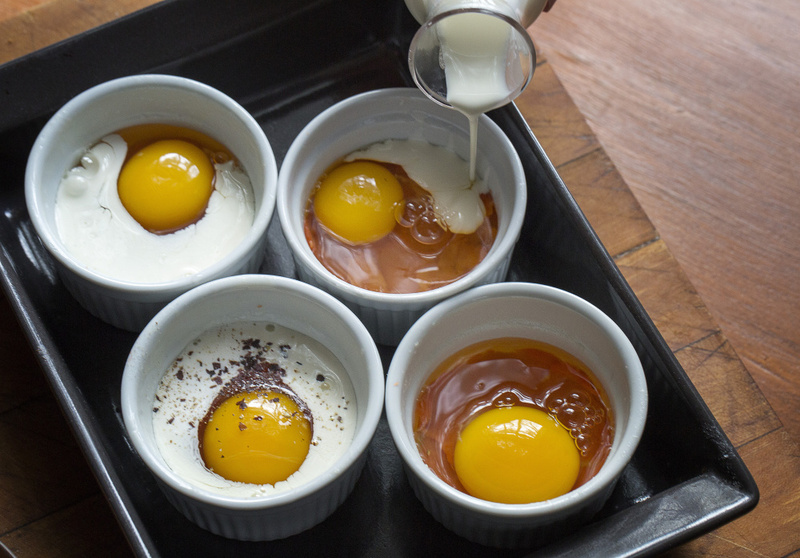 Place the baking dish in the oven and pour boiling water in the baking dish to come halfway up the sides of the ramekins; bake until whites are set and yolks are still soft, 15–17 minutes. Whip the remaining 1/2 cup cream in a bowl until soft peaks form and fold in the horseradish. 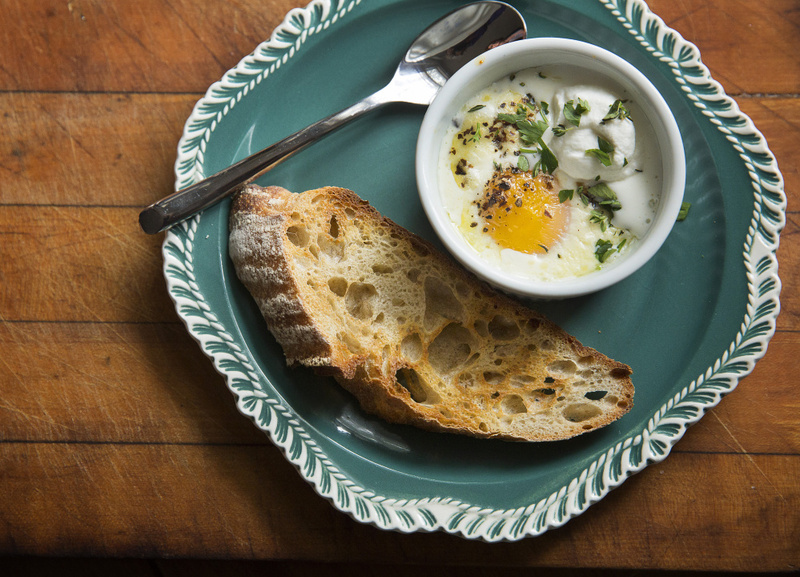 When the eggs are done to your liking, remove the ramekins from the water bath, garnish them with a dollop of the horseradish cream and the chopped herbs. Serve immediately with the crusty bread.